Looking up into the balloon. Damn, that was a big flame! Two balloon tooks off at the same time. The other balloon was about a half mile ahead of us. Our partner balloon heading toward a tree-top-touch. Because it was an early morning flight, there was still some fog on the ground. Looking almost straight west about 15 minutes into the flight. The new Parkview hospital complex dominated the horizon in the southwest. Looking straight down was a bit of a "trip"
All of the buildings and trees look like miniture toys. 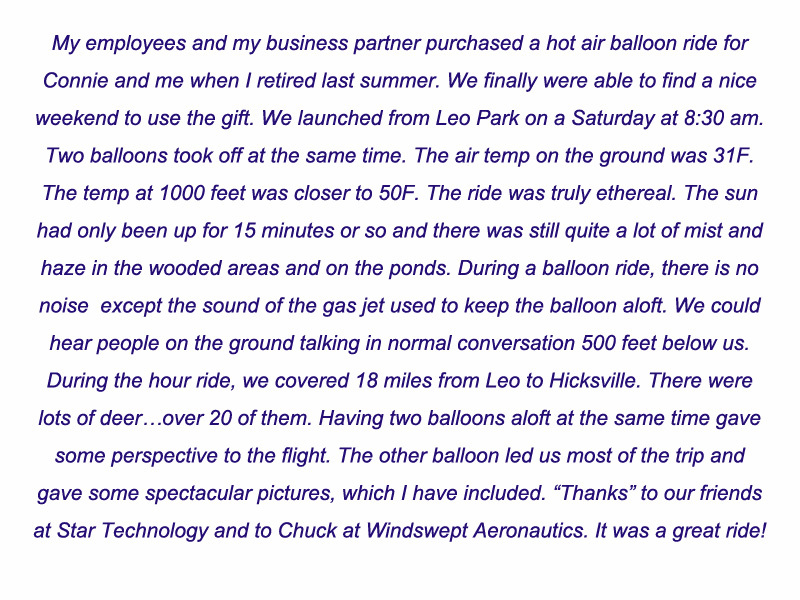 This is the other balloon crossing in front and below us by a farm pond. An Amish family in their buggy. The clip-clop of the horse's hooves was easy to hear even 1000 feet above. Our intrepit pilot, Chuck Wyss. Our partner balloon in the distance and our shadow inthe trees. Our shadow on a stand of trees. Looking straight down at trees gives a whole new perspective on them. Approaching Hicksville, OH. Our partner balloon was about a mile ahead of us. Any landing you can walk away from is a safe landing!